ROAM captures Australians enduring love of caravanning, camping and adventure. ROAM is an eclectic gathering of stories, news and reviews. Each issue features 'Ask the Leylands' in which readers have their questions answered by the legendary Mal & Laraine Leyland. Plus we interview a well-known Aussie for our 'Camping with the Stars’ segment'. ROAM delves into the history of classic caravans and profiles the people who own and build them. It’s Time to Roam Australia! Fantastic magazine! 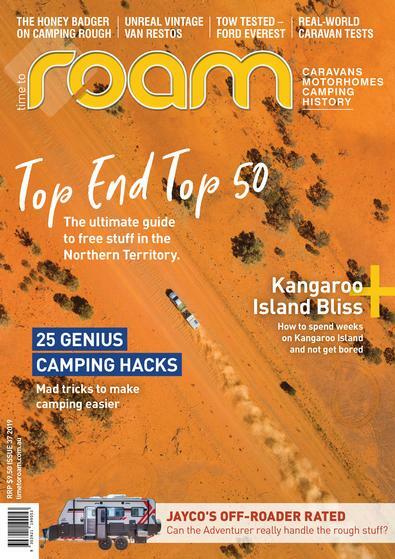 A friend recommended Time to ROAM Australia magazine so I went out and bought it. Beautifully presented, very interesting articles, caravan, camper and motorhome reviews. Thoroughly enjoyed the article about &apos;The Australian Caravan History - it&apos;s origins, history and the people, absolutely loved seeing the photos of the old caravans. Enjoyed the &apos;Reno Rescue&apos; article too and the social pages featuring like-minded caravanners. Keep up the great work and look forward to getting my next issue. ROAM is great reading - full of interesting articles, destinations to visit, reviews, classic caravans and makeovers - I never miss an issue. For bi-monthly titles please allow up to 2-5 weeks for your first delivery. Your subscription will begin with the next available issue.